Prizes and Raffles: There will be free product tosses throughout the day as well as a number of raffles for great products from Toggenburg and our sponsors. 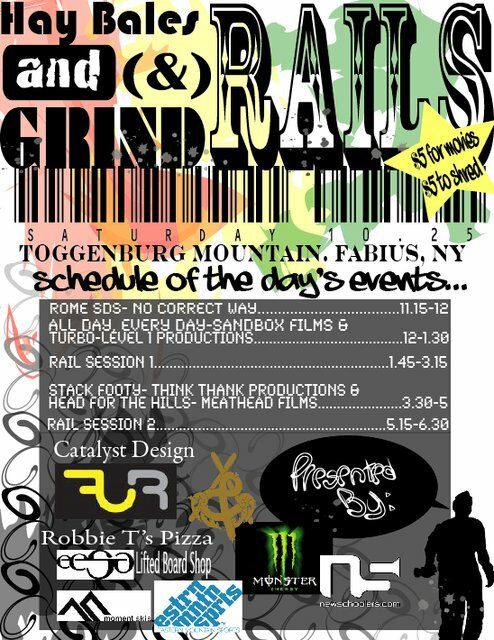 Come out to Toggenburg on Saturday, October 25th to kick off the '08-'09 season in style. Early season rail slaying, 5 of the year's best ski and board films, and tons of free gear at Central New York's only pre-season rail jam and film festival. For more information or to answer any of your questions contact toggparkcrew@gmail.com. See you on the 25th!